Windblown waif arrives at Pickerings Pasture. 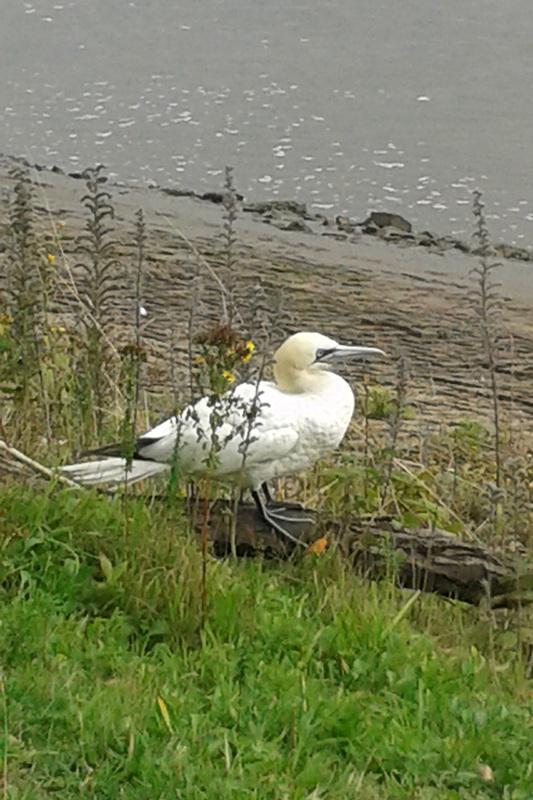 The gannet on the embankment. 17th Sept 2013 Two local bird watchers went to Pickerings Pasture following the gales of the previous day and night. 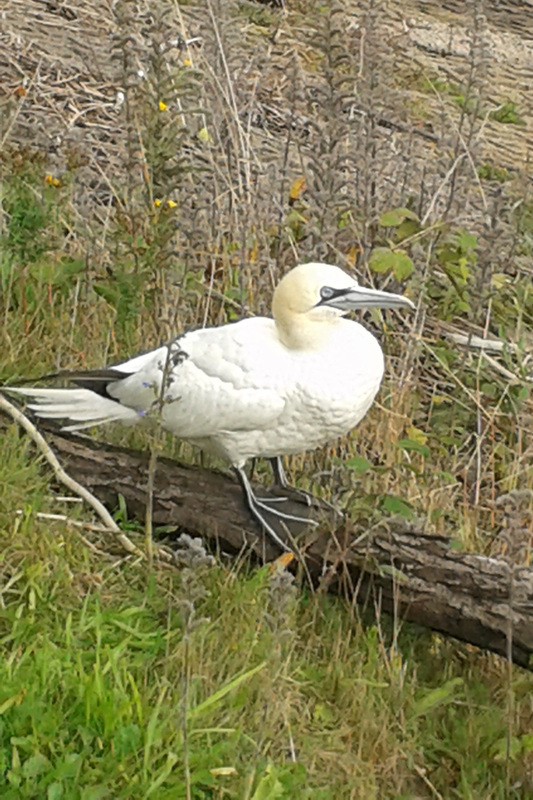 On the embankment towards the white bridge they saw an adult Gannet which was sitting in the vegetation. Photographs were taken by Mark Edmondson at close range and the bird did not appear unduly worried by their presence. We presume the bird was exhausted after the strong, gale force winds and was blown inland up the river to Pickerings Pastures. They watched the bird for some time and prevented dogs and people from disturbing it but eventually the gannet took off and headed out into the River Mersey following the river towards the estuary. Gannets are seabirds which normally spend all their lives out at sea. Most gannets head southwards towards the Bay of Biscay but some travel further: to the North African coast or into the Atlantic. When the juveniles are about five years old they return to their cliff breeding colonies, building a nest and laying just one egg. They normally breed on isolated offshore islands. The nearest colonies to us are Grassholm in Wales and Ailsa Craig in Scotland - both islands: though the colony at Bempton in East Yorkshire is on a sea cliff below the coastal footpath where excellent views and photographs can be obtained of the breeding activity. 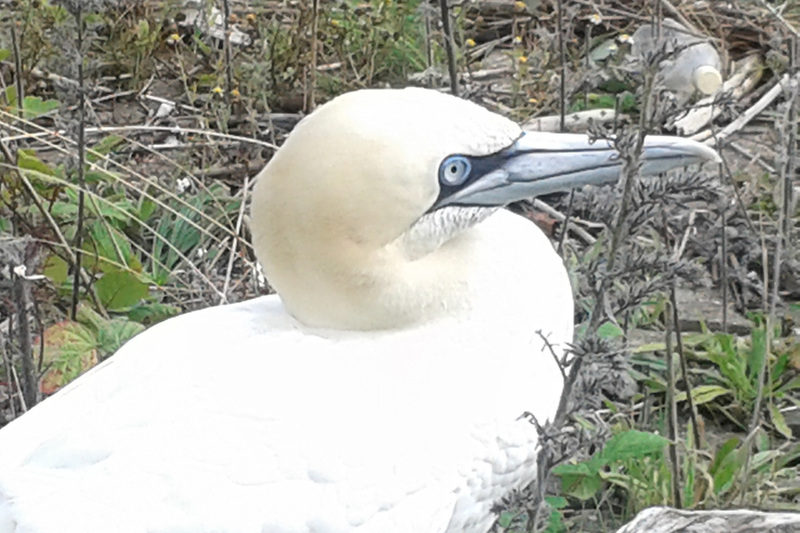 The eyes of the gannet are a clear blue.